Saturday April 5th 1925 It was late when we had breakfast. Soon after started for a ride and the folks left us at The Station. Pleasant trip down. Found a Granville bus ready to go and was soon home. Aunty well and got on nicely alone. Monday April 6th 1925 Went down town for Ida. Wrote Fannie & Lydia. I rested in afternoon. Ida on the couch most of the day. 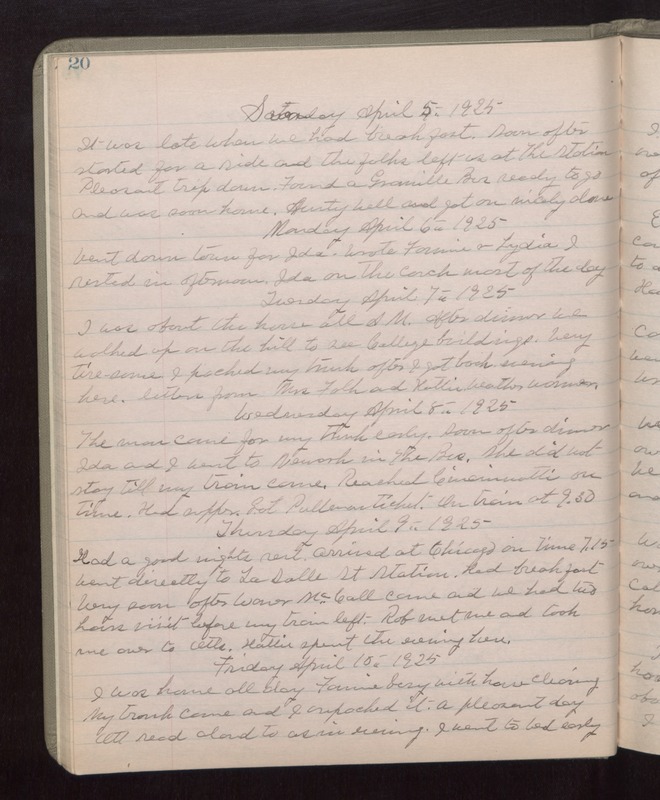 Tuesday April 7th 1925 I was about the house all AM. After dinner we walked up on the hill to see College buildings. Very tire-some. I packed my trunk after I got back evening here. Letters from Mrs Falk and Hattie. weather warmer. Wednesday April 8th 1925 The man came for my trunk early. Soon after dinner Ida and I went to Newark in The Bus. She did not stay till my train came. Reached Cincinnatti on time. Had supper. Got Pullman ticket. On train at 9.30. Thursday April 9th 1925 Had a good nights rest. Arrived at Chicago on time 7.15. Went directly to LaSalle St Station. Had breakfast. Very soon after Warner McCall came and we had two hours visit before my train left. Rob met me and took me over to Otts. Hattie spent the evening here. Friday April 10th 1925 I was home all day. Fannie busy with house cleaning. My trunk came and I unpacked it. A pleasant day. Ott read aloud to us in evening. I went to bed early.